KRION K-LIFE, the new air-purifying solid surface, could easily outshine other innovative creations, but the new TERRAZO and LUXURY Series have successfully contributed to the revolution KRION is stirring up on the construction materials market. Although both series were presented at the PORCELANOSA Fair, it is at CERSAIE 2017 that they have been truly recognised as a fantastic solution in the world of decoration and design. TERRAZZO is the name of the new KRION® collection, which seeks to pay tribute to the aesthetics and also the technique of reusing materials that began in the mid-17th century in Venice, when excess pieces of marble were used to produce conglomerates with cement, forming terrazzo as a new construction material. The conception of this new collection was largely guided by the goal of achieving a purified finish to ensure easy combinations with other fashionable materials including metals and wood. SCS certification proves that 40% of the material used is recycled. The LUXURY Series by KRION® brings us the beauty of nature. The series comes in three new colours: CARRARA SOFT, NACRE and GREY CEMENT. 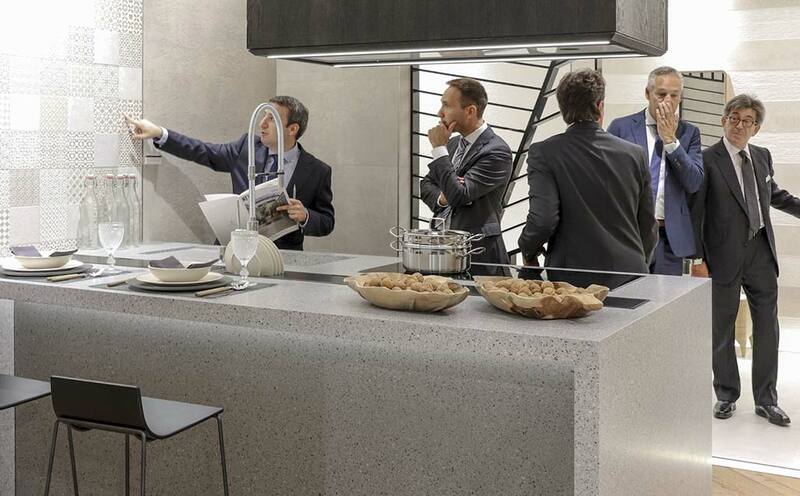 Its finishes are a sophisticated simulation of natural stone, combined with the magnificent quality of KRION®. Using these elements produces a carefully designed vein effect which, like all KRION® colours, can be seen throughout the entire piece, making it ideal for creating decorative KRION® techniques and easy to repair.